Tis the season of lots of sweets and treats – add some fruits and veggies to your kids' diet with this healthy sandwich recipe. 1. Make a sandwich using your 2 slices of white bread and sandwich filling of your choice. Take a large drinking glass or circle cookie cutter and cut your sandwich into a circle shape, discarding the crusts. Place sandwich on a plate. 2. Grab your large carrot stick and your veggie peeler and make a long, thin slice from top to bottom of your carrot. Wrap this long slice around your snowman for it’s scarf. 3. Still using your carrot, slice a triangle nose for your snowman using your knife. Place this carrot nose on your snowman. 4. Slice your 2 black olives in half. Take 2 halves and place them on your snowman for the eyes. Take the remaining olive and slice it into 5 small pieces for the mouth. 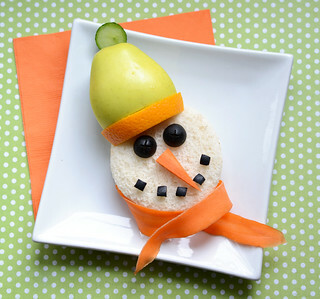 Place the mouth on the snowman sandwich. 5. Now let’s assemble the hat. Your hat starts with 1 slice of navel orange, followed by half a green apple, and stick your slice of cucumber at the top. Frosty is so cute, your kids are sure to love him – I know my kids did! Enjoy!